A team of highly trained carvers used stencils to carve and etch the intricate design of the horse, flags and logos. Each wild stallion took approximately eight hours to carve where the logo took up to 16 hours to hand carve. The South Point 400 logo and winning year features hand burnished 23 karat gold leaf, which took more than 8 hours and over .25 to .50 grams of hammered gold. 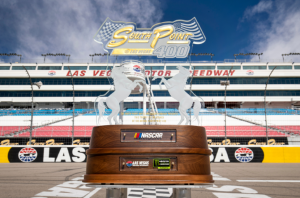 The base was made by a master wood craftsman that engineered the trophy out of specially selected walnut and cherry hardwood to resemble the tri-oval of the Las Vegas Motor Speedway.